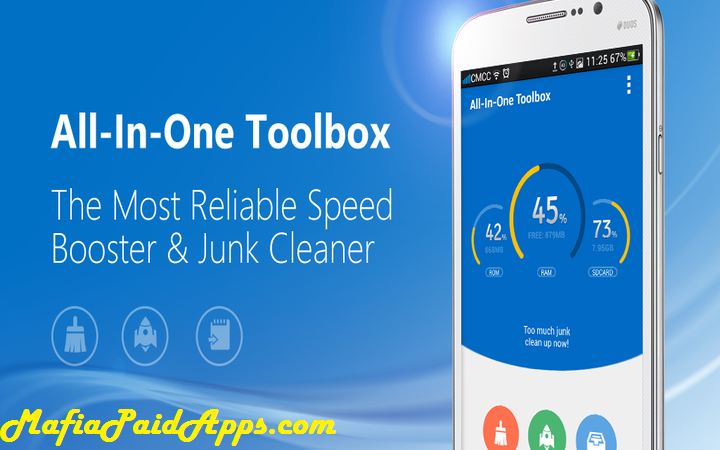 All-In-One Toolbox (Cleaner) is designed to optimize system performance, manage files, secure privacy of your Android device. It allows to clean junk files, end running process, bulk operate apps, manage startup items, uninstall system apps, explore SD card files, block notifications, lock apps and do many other tasks with its abundant build-in handy tools. Control to show or block app notifications on Android status bar. Blocked messages will be saved together for later check or clean. Created in a simple method of seeing what's taking up precious storage and reclaiming lost space via one tap smart cleaning. Junk categorizes: system cache, app cache, temporary files, residual files, app leftover, thumb images, empty folders, useless apk files, browsing history, download history, email history, call log, SMS logs, social app messages..
End useless background process to release memory/RAM for necessary app running via one click. Sort process by usage of RAM or Battery. Enable boost+ to accelerate phone speed 2x faster. Decrease the temperature of CPU by closing process excluding the system defaults and white list apps with one tap. * System Uninstall: Root required. This option is very useful in phones containing useless factory apps(bloatwares), default manufacture apps. Check what’s on external SD card and provide a list of options to control files/folders. - Enable notification icon or widget for quick access to preferred 20 options like clean, boost, calculator, alarm clock, battery, gallery, etc. - Add protect process to white list for clean or boost. Drop us email to support@aiotoolbox.com for any suggestions, feedback or translation help.